The Verde Canyon Railroad Adventure begins at the depot in Clarkdale travel to the ghosttown of Perkinsville in Northern Arizona Verde Valley. The roundtrip takes 4 hours into an unforgettable wilderness and adventure that is great for the whole family. The trip begins at the old Clarkdale Depot where a few old steam engines and the history are parked. Until the train engineer yells 'All Aboard' its time to get onto one of the old train cars that is history all of its own. The train blows the whistle and makes its way to the ghosttown of Perkinsville. The engineer and the staff points out historical formations of the pinnacle red rock that tower the sides of the track, nestled in the rock cliff dwellings of people of long ago inhabited the area. Cross the Verde River and you'll see some wildlife that lives there. The engineer narrates through the whole tour. So relax and listen to railroad tunes of the past. You'll have an adventure on the Verde Canyon Railroad will open all your senses of being outdoors. Take photos from the open-air car. Reservations on weekends begin in spring. Just in time to have a photo taken with the Easter Bunny. Make your way to the Verde Canyon Railroad Train Depot in Clarkdale, Arizona, not far from Sedona, to begin your Verde Canyon Railroad adventure. 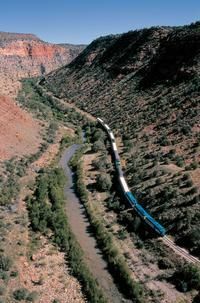 This rail adventure offers a wilderness train ride through the remote Verde Canyon which is known for its picturesque setting and abundant wildlife. Though it's possible to hike in the canyon, by far the easiest way to experience it is by riding this scenic wilderness train. The train is made up of exquisitely-renovated passenger coaches and open-air viewing cars pulled by vintage locomotives and travels a route along the Verde River between Clarkdale and Perkinsville. After embarking from the Clarkdale depot, sit back for a 4-hour, 40-mile round trip that includes views of historic mining sites, geological wonders, Sinagua Indian cliff dwellings and wildlife from bald eagles to antelope. You will remain spellbound as your vintage carriages cross an expansive railway bridge embedded in basalt cliffs, glide through a covered bridge opening the gateway to Perkinsville, or experience daylight retreating in the 680-foot manmade tunnel, all odes to that same bygone era. Two FP7 locomotives, only two of 10 remaining in North America, are the muscle that powers the newly-renovated passenger cars. Indoor cars are climate-controlled with restrooms and the train meets ADA requirements. Your first class cabins feature panoramic windows in a living room-style atmosphere of comfortable love seats or bistro-style chair-and-table seating near panoramic windows. Enjoy a champagne toast upon boarding, a variety of complimentary appetizers reflecting the southwest region and full-service cash bars featuring premium liquors and beverage service at your seat. With comfortable seating indoors and access to high-backed benches on the adjoining open-air cars, it is like getting two seats for the price of one. Verde Canyon Railroad Train Depot in Clarkdale, Arizona. Departure Times: 1pm; boarding is at 12:40pm. Exceptions: 9am to 2:30pm. If booking one of these dates, please advise of your preferred time in the Special Requirements field.